One of the most powerful and lasting images in "Sookmyeong" ("Fate"), released on March 20, involves Kim In-kwon as Do-wan, a drug addict notorious for his merciless razor blade skills. Particularly gruesome is the point when Do-wan uses the much-dreaded weapon against his elusive girlfriend. Even Kim had a hard time figuring out the reason for such a cruel act. "How can a human being so vicious? Well, I believe Do-wan has a valid reason because he is on the verge of a breakdown after going through a life-or-death moment and, in fact, he has nothing to lose", Kim told The Korea Herald. Kim, who made his debut as an actor in 1998, has upgraded and amplified his silver-screen image on "Fate". More important, Do-wan's role is central to the movie's plot, together with other central characters played by Korean Wave stars Song Seung-heon and kwon Sang-woo. Kim said a little bit of understanding is needed to identify Do-wan's complex and cruel mind-set. "His background is always associated with knives, and he has scars all over his body. But he is, at heart, weak, vulnerable and lonely", Kim said. "Do-wan is also a hopeless drug addict, and the last decision is not his own but the one who feeds drugs to him". 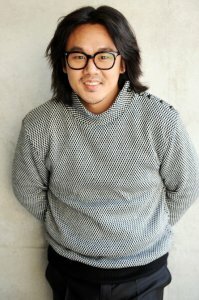 Kim said "Sookmyeong" offers a turning point for his acting career as he is now, albeit vaguely, aware of what the audiences really like about his performance on the big screen. Kim steered out of the film industry into television shows briefly, only to realize that acting for films is hardwired into his brain. "I noticed that films are where I should be, and I can fit in nowhere else", Kim said. His penchant toward acting started with his desire to become a filmmaker. At first, he jumped into the film industry learning how to handle film equipment -- something that he assumed would come in handy when he became a director. Although his career path did not go in the direction he wanted, Kim said his deep interest about filmmaking itself gave him a key foothold as an actor. "My perception and knowledge about filmmaking is helping to sharpen my performance as an actor, and I want to use that knowledge to my own advantage", he said. "Fate" was challenging for Kim because his role required plenty of dangerous action scenes. He suffered hand injuries when he jumped through a window with shattering broken glass. "It was just like torture when I was asked to crash down to the ground a dozen times", Kim said. Kim is now preparing to join another film project spearheaded by director Kwon Yeong-cheol, and the role happens to be a villain -- perhaps more vicious than Do-wan. "The new film is about three bad buys who steal to make a living", Kim said with a gentle smile on his face. "And I'm the most terrible baddie". The East Asian Forum and Review is hosting a seminar on the Korean Wave this Friday at the Johns Hopkins University in Maryland. The 9th Jeonju International Film Festival will kick-off with Japanese director Kunitoshi Manda's "The Kiss" on May 1. The festival features a total of 195 films from 40 countries, in a record-sized lineup that underscores the filmfest's growing influence at home and abroad.